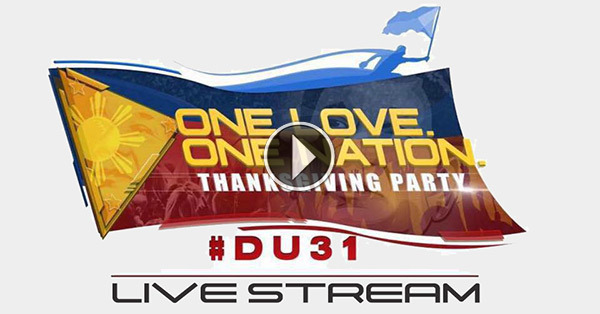 Watch the live stream of the victory party for President-elect Rodrigo Duterte dubbed "DU31: One Love, One Nation Thanksgiving Party" here. Over 100,000 people are expected to attend the 12-hour party to be held at the Crocodile Park in Davao City at 1 p.m. of June 4 to 1 a.m. of June 5. The organizers earlier said 586 performers from Manila and Mindanao will perform during the thanksgiving party, which plays on the phrase "Duterte won." Among those expected to perform are KZ Tandingan, Jimmy Bondoc, Gladys Guevarra, Carlos Agassi, Andrew E., Ivy Violan, Bernardo Bernardo, Isabel Granada, Bradley Holmes, Mark Mabasa, Erich Gonzales, Daniel Matsunaga, and Vice Ganda. Sale of alcohol and illegal drugs is prohibited and smoking is banned during the victory party. PTV4, the government-owned People's Television, will cover the event live. The coverage starts with hourly updates from 1 p.m. until 9 p.m. Live telecast of the DU31 thanksgiving, Duterte victory party begins at 9:15 p.m., after the PCSO lotto draw. It has been reported that only PTV4 will be allowed on the media platform initially arranged for all broadcast networks.